Wabash College President Patrick E. White has announced that the College has received an $8.1 million grant from Lilly Endowment Inc. that will continue the work of the Wabash Center for Teaching and Learning in Theology and Religion through June 30, 2012. During this new grant period the Wabash Center will host approximately 150 additional faculty members in 12 different on-campus workshops and colloquies, over 45 consultations will take place on campuses across the country, and up to 350 new faculty will take part in shorter programs at regional and national conferences. More than $2 million in grants will be issued to individuals and institutions. A Graduate School Teaching Initiative which will work with doctoral degree granting institutions in theology and religion to assess how well their programs prepare graduate students to be teachers. A Theological Education Teaching Initiative which will hold conversations related to the theoretical underpinnings of practical theology and its place in seminary curricula. Ongoing conversation and study in the area of online courses and their pedagogical strengths and weaknesses. The development of an evaluative learning program for its grant recipients which will provide consultants to help the grantees develop evaluation and assessment strategies appropriate to their grant project. The Wabash Center for Teaching and Learning in Theology and Religion is wholly funded by grants from Lilly Endowment. Inc. This $8.1 million grant brings the total grant amount received from the Endowment to $35 million for 17 years of programs. 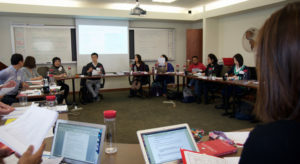 The Wabash Center organizes its activities around five areas: strengthening teaching and learning; developing the professoriate in theology and religion; supporting teaching environments in theological schools and religion departments; understanding new technologies in teaching and learning; and developing scholarly literature on theological teaching.